Running out of low disk space? You may need to check for unused packages (orphaned packages) filled in your hard drive. Orphaned (unused) packages are nothing but the packages which will be installed as dependencies/libraries when you install a software in your Linux system. As you know already, whenever we install an application, some other packages (dependencies) will also be installed along with the application you are installing. These dependencies might exist in your hard drive even after you removed the application. After a particular period of time, your hard drive will be flooded with unused or orphaned packages, and you might end up with low disk space. Low disk space not only affects the system performance, it will also not let you to install new applications due to low disk space. So, it is very recommended to wipe out the orphaned packages at regular interval. This brief tutorial will explain how to remove unused, or unwanted, or orphaned packages in popular Linux distributions such as CentOS and Ubuntu. First, we will see how to find and remove unused packages in Ubuntu and its derivatives such as Linux Mint, elementary OS. Once installed, run it as shown below to find out the orphaned packages. This will list all the unused packages. As you see above, I have few unused packages in my Ubuntu system. Select the files and select Ok to remove the all fines. 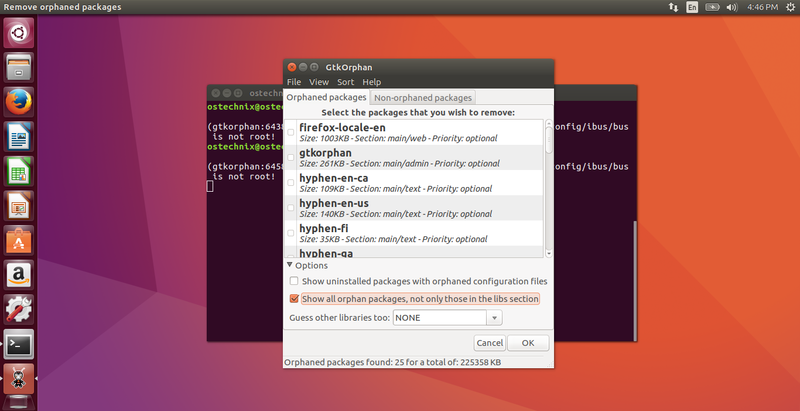 Gtkorphan is the graphical tool that allows us to find and remove orphaned packages. Gtkorphan is only for desktop editions. If you’re using Ubuntu server without GUI, use Deborphan instead. Gtkorphan’s default interface will look like below. Since we already removed the orphaned packages, it shows nothing. However, at the first time, we need to initialize the system in order to keep track of needed packages, even if they are listed as orphaned. To do so, from the main window, expand the“Options” section and check the box that says – “Show all orphan packages, not only those in the libs section”. Now, Gtkorphan will list the orphaned packages. However, you must careful here. As you see in the above picture, Gtkorphan lists some important packages as unused. We shouldn’t remove them. In order to keep the important packages, right click on the package name, and click Hibernate package option. This will keep the packages from removal by Gtkorphan. You only need to do this at the first time. After that, you can remove the orphaned packages if any exists. Once you hibernated all important packages, scroll down through the list of other packages. If you don’t need any package, just riht click on it and click “Select for removal” option. Alternatively, run the following command to remove the unused/orphaned packages all at once. Congratulations! Now, you have freed up some space in your hard drive. Rpmorphan is a command line utility that can be used to find orphaned packages in RPM based systems, such a RHEL, CentOS, Fedora, Scientific Linux, SUSE etc. rpmusage : display rpm packages last use date. rpmdep : display the full dependency of an installed rpm package. rpmduplicates : find programs with several version installed. rpmextra : find installed packages not in distribution. Then, download Rpmorphan package from the following link. As of writing this, the latest version was 1.16. It’s also possible to display the orphaned packages of a specific period. For more examples, refer the man pages. If you no longer need those orphaned packages, just remove them using yum command and free up your hard drive. That’s it. I will be here with another interesting and useful tutorial soon. Until then, stay tuned with OSTechNix. If you find this guide useful, share it on your social network.